There is a great variety of pencil types, prices, etc. How to know which kind(s) to pick? It's been a few years since I was in college and used pencils much...at the time I wasn't too picky about kinds, except sometimes for scan-tron sheets. I have heard people express concerns about different kinds. So, we decided to test some various brands for ourselves to see what we liked/thought would work well. We try not to send things in our OCC shoeboxes that we wouldn't use ourselves. So, we pulled out all the different kinds we had on hand. 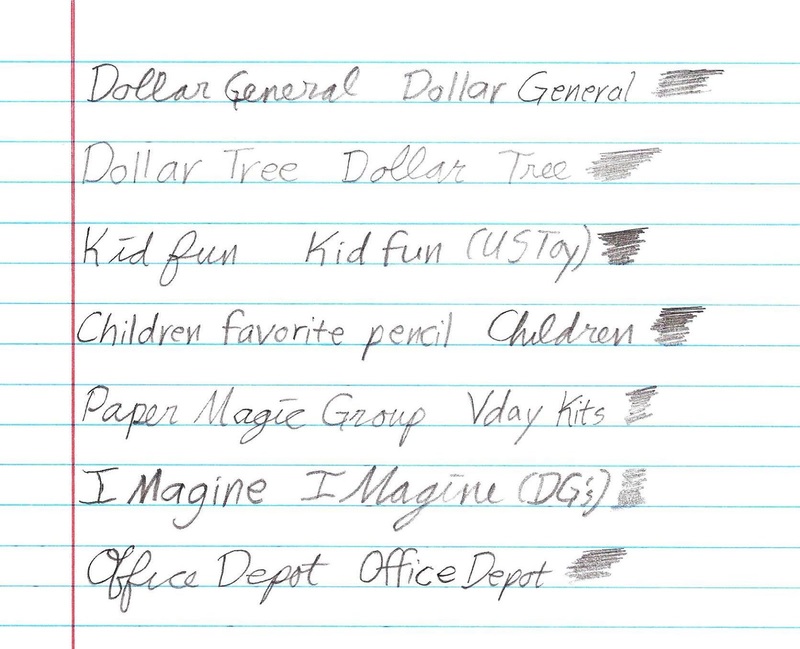 We had: Dollar General holiday, Dollar Tree holiday, Kid Fun Fun (bought from USToy), Children Favorite Pencil (bought at Mighty Dollar), Paper Magic Group (VDay kit), iMagine (Dollar General back-to-school time), and Office Depot Brand. When laid side by side there were some slight differences noted such as overall length. The metal parts and erasers were also different sizes, but nothing major. Note, I didn't test the erasers as I personally always send an extra eraser, and I also want to still send these pencils for OCC shoeboxes, just sharpened, but couldn't do that if I used the erasers. All the pencils seemed to sharpen pretty well when we tested them with a hand sharpener, some had a little peeling of the decorative coating, but nothing too major, although I have seen that once or twice, not sure if it was a glitch, or normal, but all of these were okay. We tested writing and shading with all the pencils. We found they were pretty similar for the most part. The Dollar Tree one was a little scratchy to write with, but it also stayed sharp the best, so may actually be my favorite to send for that reason. The iMagine (Dollar General) ones were the nicest to write with, but were the hardest to keep sharp. All in all, we'd personally use any of these for ourselves, so will probably just pick based on price/what we can find to send in Operation Christmas Child shoeboxes. However, I do plan to try to mix the kinds in each shoebox since there were slight differences, and I feel some like the iMagine seem easier to write with, while the Dollar Tree ones may last longer, and different people prefer different kinds, and so will the children receiving them. For the reviews of more kinds, you can check out this post I found: Review of Five Very Cheap Yellow Pencils. Also check out my other pencil review right here at Simply Shoeboxes: Colored Pencil Brand Review. We have also done crayon brands reviews, both coloring and melting tests. We wanted to check to see which brands were okay to send thru an Operation Christmas Child shoebox where heat may be a factor. Disclaimer: Please note, this is just our personal test/experience with these brands of pencils we tested for our personal information and decided to share in hopes it could help others who didn't have the chance to do it for themselves. I realize others will have different opinions, experiences, preferences, and considerations, this is just what we found and are sharing to try to help others. Pencils are a valued item. Something so simple that we take for granted, but some families have to break pencils in 2 or 3 pieces to share with multiple kids, just so they qualify for school. 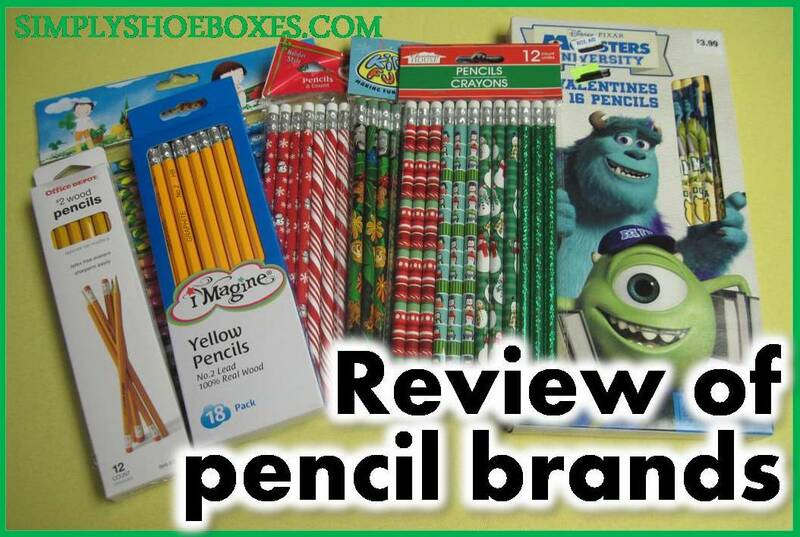 Pack lots of pencils!